The mullein bug, Campylomma verbasci (Meyer-Dür) (Hemiptera: Miridae), a palearctic zoophytophagous insect or plant-feeding predator, is common in apple orchards of North America. 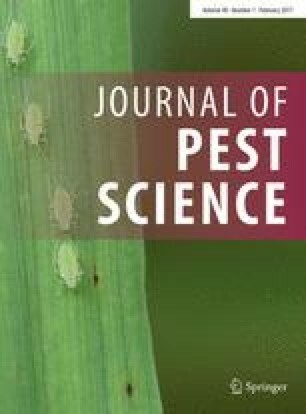 The aim of this study was to evaluate the influence of the biotic environment (extraguild prey and intraguild predators) on the phytophagy of this zoophytophagous bug. We hypothesized that (1) the presence of extraguild prey should reduce the intensity of phytophagy by the mullein bug and that (2) the presence of intraguild predators should reduce the intensity of phytophagy by the mullein bug as an intraguild prey. Phytophagy was evaluated by observing (1) mullein bug feeding punctures in the laboratory and (2) apple fruit damage by mullein bug in the field. Two extraguild prey types were tested: Aphis pomi De Geer (Hemiptera: Aphididae) and Panonychus ulmi (Koch) (Acari: Tetranychidae), at four densities each (zero, four, eight, and 16). Seven combinations of insects were tested using one mullein bug nymph with or without an intraguild predator (coccinellid). Our results confirm the first hypothesis, but only partially confirm the second. The number of feeding punctures only decreased in the presence of some intraguild predators. We are grateful to Caroline Belle, Mathieu Ratelle, and David Chouinard for their technical assistance, Jonathan Veilleux for linguistic revision of the manuscript, and Michèle Grenier for statistical analysis. We also thank two anonymous reviewers for valuable comments on this manuscript. This study was funded by a grant from the Programme de soutien à l’innovation en agroalimentaire du Ministère de l’Agriculture, des Pêcheries et de l’Alimentation du Québec (Quebec, Canada), and a Natural Sciences and Engineering Research Council of Canada discovery grant to E. Lucas.